We are engaged in providing our customers a broad array of Holographic Wide Web Films that are widely accepted by our clients. These are particularly meant for packaging industry and have a huge demand in the market. Our Holographic Wide Web Films are manufactured from finest quality raw material. The complexity of the holographic pattern makes it nearly impossible to be reproduced, by adding additional, nearly invisible authentication markings known only to our clients. Holographic product label with customized images, involves technologies that are out of reach of most counterfeit rings. 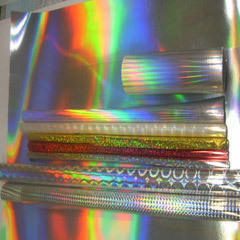 Looking for Holographic Wide Web Films ?